Despite the relative mildness of this winter, the soil temperature (and thus the spring garden) is actually a smidge behind last year's conditions. I suspect that last winter's heavy coat of snow insulated the soil surface, and that this year's clouds worked in the opposite direction to make the soil colder than it normally would have been. No matter what the cause, I only planted my first unprotected garden seeds yesterday --- breadseed poppies. I would normally have planted some early peas too, but the earth hasn't warmed to 40 degrees yet, so there's no reason to let my seeds rot in the ground. Despite the cold spell this past weekend, lettuce is up and running under the quick hoops --- I hope to be able to pick some in two or three weeks. 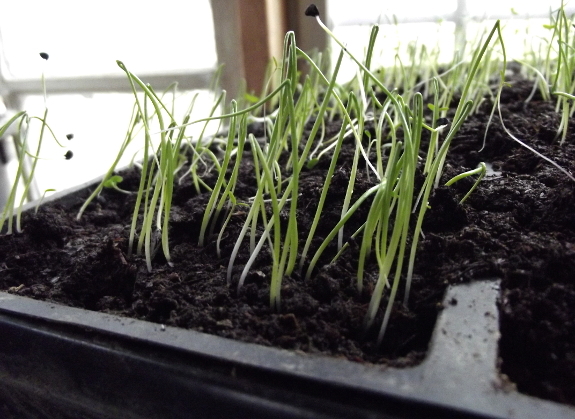 Meanwhile, the onions I seeded inside came up thickly. About the same time I'm picking the first spring lettuce, I'll be teasing the seedlings apart and setting them out in their final garden home. Our chicken waterer is the POOP-free alternative to filthy, traditional waterers. So what the difference between "bread Poppies" and regular Poppy flowers? Hi! We just ordered your chicken waterer package. We only have 6 chickens but figure it can't hurt to have 2 waterers in the coop and one outside it during our hot summers. Can't wait to finally have this poop-free water you've been talking about! Also wanted to let you know that the raspberries and blackberries you gave us at the Organic Grower School last year are doing fantastic. We actually got a handful of raspberries last season, too (or rather, our daughter did). It's interesting to hear about your soil temperature findings. We don't have snow down here much any year, but none so far this season. Most of our soil temp conversations revolve around when to expect the morels, though. Oh! And congratulations about your inclusion with Mother Earth News! Looking forward to your book. Justus --- I should have included a link in the post. Breadseed poppies are the ones you use to grow poppy seeds for baking. There are lots of ornamental poppies you might be referring to when you say "regular poppy flowers". The ones I've grown are the bright red Shirley poppies, but I think people often also grow California poppies, and some perennial poppies. Eliza --- Thanks so much for buying our waterers (and for your congratulations)! I'm so glad to hear the brambles did well for you, although I'm not at all surprised. They should take off this year! Morels.... They still seem far away here. It won't be long before you two are eating fresh garden vegetables 12 months of the year! Keep up the good work.